We’re at that stage of the US presidential electoral cycle when red-faced commentators are admitting they might have underestimated Donald Trump’s chances a little. A quick glance at the last six months of polling (see graph below) shows how inexorable Trump’s rise in the Republican Party race has been, upending predictions he would fizzle out or self-destruct. Among politicos of all stripes, that rise is now provoking anxiety verging on panic. With the Iowa Caucuses that launch the primary season only days away, there seem ever fewer pathways for someone backed by the Republican establishment to emerge as a viable challenger to Trump and second-place Ted Cruz (who is associated with Evangelical and Tea Party sections of the GOP, and best known — and hated — for his part in causing a government shutdown in 2013). Any hopes the Republican National Committee (RNC) may have had that the anti-Trump vote would coalesce around one of its preferred candidates, maybe Jeb Bush or Marco Rubio, look increasingly forlorn. Perhaps the only thing that can save Trump’s opponents is the reported weakness of his campaign on the ground. On the Left (in its liberal and more radical versions) there has been a schizophrenic reaction, with Trump alternately treated as a joke or the most dangerously reactionary candidate of all time. 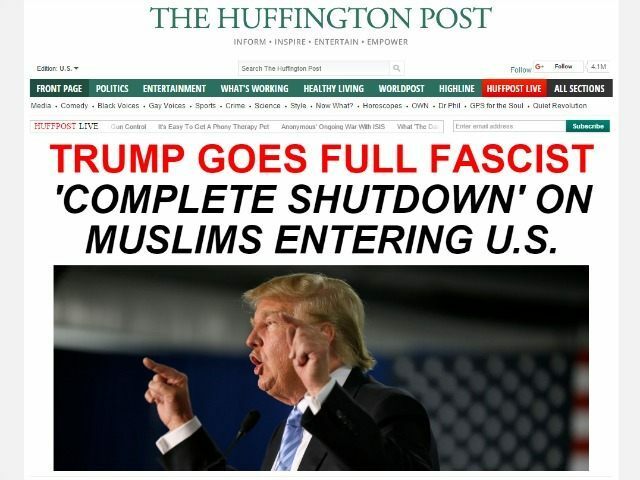 The confusion was perhaps best expressed in the Huffington Post’s relegation of Trump to the Entertainment section until the billionaire’s promise to temporarily halt Muslim entry into the country, when Ariana Huffington suddenly announced his return to the serious news section along with the headline, “Trump goes full fascist”. Behind the surprise over Trump’s sustained success lies a deeper confusion over his political strategy and the context that he is taking advantage of. There is a tendency — concentrated on the Left but also in many conservative analyses — to overstate how radically right-wing he is on issues and to then presume that his support must reflect some kind of significant radicalisation on the Right of US politics and society. In this blog post, I want to start to unpick some of these arguments. It is my contention that Trump’s success occurs not because of a significant social radicalisation to the Right but because of discontent with the representative political system among Republican voters — and voters in general. In the case of the GOP, the party’s problems are reflected in the fact it has only won one presidential election in the 27 years since Bush senior won in 1988 (2000 doesn’t count; Dubya lost the election but won the Supreme Court). As party identification has waned in the US, the remaining GOP-identifying voters have become increasingly angry with the party leadership over a wide range of policy and political issues, including the constant “rinse, repeat” of the RNC’s failed electoral strategy. More generally, disaffection with politics-as-usual has reached fever pitch across the political spectrum. The long-term and growing disillusionment in GOP ranks has provoked a series of rebellions, with the Tea Party insurgency the best known. Yet many politicos and commentators made the mistake of presuming that everyone drawn to the anti-government ravings of Tea Party activists agreed with their hard ideological mindset, rather than the Tea Party mostly tapping into already-existing fury at the Republican establishment. Similarly, Sarah Palin’s greatest successes have been as an anti-establishment figure (e.g. when she first came to notice in Alaska) rather than when tied to a mainstream election campaign (such as in 2008) or trying to hitch her political wagon too closely to various hard Right blocs in the party. Donald Trump, too, has tapped into this rebellion, but has done so in a way that cuts across the usual factional and ideological divisions both within the Republican voter base and the wider electorate. He has done so not (as many claim) because he is the ultimate right-wing ideologue, or because he foments racial division as bad as just before the Civil War (sic), but because he openly and in a very non-ideological way trashes the political class and its failures. By focusing on his Trump’s really brutal policies (especially his stances on illegal immigration and border security), commentators have ignored how the vast bulk of his positions are to the Left of most of the GOP field. Interestingly, the outing of Trump as a closet liberal was an angle that Fox News used to try to discredit him soon after he entered the race, but party supporters simply didn’t seem to care. Both Bush and, more recently, Cruz have also unsuccessfully attacked on this basis, and the National Review has just published 22 “Against Trump” essays by prominent conservatives, some arguing that Trump is not a true conservative. Trump’s strongest support is from GOP voters who self-identify as “moderate/liberal”, and he does much better in traditionally moderate-leaning GOP electorates (for example, in northeastern states) than hard Right candidates have in the past. In case it needs spelling out, in speeches and in his manifesto, Crippled America, Trump argues for: protectionist trade policies as part of massively reinvigorating industrial production to create quality jobs; vaguely defined tax cuts and changes to the tax code to promote growth; more funding for schools and health services; replacing Obamacare with a system that brings the insurance companies to heel (until recently he’d even supported single-payer); and rebuilding crumbling infrastructure. It’s a fairly traditional populist, government-led pitch of growing the economy (and the government) out of its problems — and the popularity of the pitch overturns the myth that the disaffected Republican base was dominated by Tea Party style politics. We have done a tremendous disservice not only to the Middle East — we’ve done a tremendous disservice to humanity. The people that have been killed, the people that have been wiped away — and for what? It’s not like we had victory. It’s a mess. The Middle East is totally destabilized, a total and complete mess. I wish we had the $4 trillion or $5 trillion [spent trying to topple regimes]. I wish it were spent right here in the United States on schools, hospitals, roads, airports, and everything else that are all falling apart! So if Trump is generally a political moderate and not an ideologically pure right-winger, how to explain his immigration and border policies, which are the harshest of any candidate? They make most sense as part of Trump’s anti-politics — his blistering critique of the current political class as inept, bought-off, beholden to corporate donors, and too ineffectual to take the decisive action needed to fix America’s problems. That they are generally “weak”, “stupid”, “low energy”, “incompetent”, “sad sacks”, “losers”, etc. Trump’s response to political class failure is to portray himself as a non-politician who can overcome them to get results both because he is an outsider to political pay-offs, lobbying and game-playing, and because he has a proven track record as a strong, flexible dealmaker who has built a respected real estate, hotel and luxury brand empire. Crippled America sets out his twin claims — the failure of the politicians contrasted with his successful track record of strength and deal making — in the same chaotic, rambling, angry, peppered-with-asides-and-digressions style that characterises his public speeches. Given the media’s predominant focus, it is remarkable how little time he spends in his speeches on the outrageous policies and statements that he uses to attract media outrage (a media strategy that goes right back to his bestselling business book, Art of the Deal). Two further aspects of his pitch are worth noting. First, his obsessive reporting of his opinion poll results further cements the idea that his non-politician approach is a winner in the world of politics also. Notably he refuses to commission polling and focus groups of his own, which he attacks as part of the unreality of modern politics. Secondly, his refusal to admit when he has been caught out making stuff up reinforces the idea that he would be a strong leader who wouldn’t apologise for the United States. With both tactics he further underlines the chasm between himself and the politicians he derides. It is this aggressively anti-political stance, and not his alleged radicalism, which has really unsettled his opponents and led them to claim he operates beyond the bounds of acceptable politics. The immigration and terrorism issues fit here. Trump’s pitch is that professional politicians have run the nation down. As he is fond of repeating, “If we don’t have borders, we don’t have a country!” By being the toughest on border issues, the only one who is willing to do what it takes to reassert the national sovereignty that his opponents have frittered away — even to do things that others consider “politically impossible” — he contrasts his strength with their weakness and stupidity. Importantly, though, the details of these harsh policies reflect Trump’s flexible, pragmatic and non-ideological approach to them. Trump may say nasty things about illegal immigrants who have committed crimes and that he will build a massive wall at the border before deporting all illegal immigrants to Mexico, but also that Hispanics are “unbelievable people” who will be free to organise legal visas and line up for entry through the wall’s “big beautiful door”. Similarly, his call for a ban on Muslim entry doesn’t include deportations and is only temporary, “until our country’s representatives can figure out what is going on”. But why does he not use other — that is, less racialised — issues to make his pitch? Firstly, because illegal immigration and Islamist terrorism have long been issues dominated by politicking, spin, and hypocrisy, but which politicians have failed to find solutions to (for example, “pro-immigrant” Obama deports more people annually than any previous US president). Thus, such issues give Trump concrete examples with which to make his more general claims about the weakness of the political class. Secondly, with issues this politically charged the possibility of attracting attention by causing an uproar is simply too good to pass up. Finally, Trump is running for the Republican and not the Democratic nomination, so he has to appeal to the debates that have caused havoc within that party. Nevertheless, the intractability of these issues means that voters are likely to hold contradictory positions on them and so it is the political decisiveness of Trump’s position rather than his (often contradictory) policy detail that will stand out. For the Left to see Trump’s modus operandi and success because he is the political expression of a psychopathic late capitalism, or because he appeals to the kind of radicalised middle class that fascists appeal to, or his allegedly “nativist” or “Tea Party” politics, or even because he is an “actual fascist”, is also to confuse how much Trump is feeding off the Republican Party’s deep crisis with the emergence of some dangerous and powerful new reactionary social base within the GOP that he represents. As conservative commentator Noah Millman (who doesn’t like Trump) has argued, Trump is not only anti Republican establishment but appeals to the Republican voters who would normally swing back behind an RNC-backed “moderate” option to keep out a radical right-wing insurgent like Cruz. This goes a long way towards explaining why the establishment has lost most of its usual control over the nomination process, smashing up the fashionable theory that “the party decides”. The reaction to Trump — with its attendant confusion, hyperbole, posturing and singling out the billionaire to protest above all the other candidates — highlights how unprepared the Left is for the possibility of him being nominated and what the consequences of that might be. At one level Trump is a product of similar disaffection with politics that has allowed Bernie Sanders to stay (and make significant ground) in the race against Hillary Clinton. But whereas Sanders represents a political class strategy to overcome the crisis of US politics with an unusually progressive populist policy pitch, Trump is the “chaos candidate” — an outsider unafraid to name political class weakness and light a bonfire under it. Just look at his response to Tea Partier Cruz’s attacks on him for having (liberal) “New York values”: smacking down Cruz for being “in bed with Wall Street” and “owned” by NYC-based Citibank and Goldman Sachs, whose campaign loans he’d forgotten to report. Similarly, Trump’s attacks on Clinton include targeting how her ties to noxious sexists contradict her stated commitment to women’s rights. In addition, as his position has strengthened, Trump has started to soften his pitch and one can watch long speeches and interviews where his border policies are largely passed over in favour of positive economic messaging and vicious critiques of foreign policy disasters caused by Democrats and Republicans alike. Palin came to prominence in Alaska,not Arizona,as the article linked to makes clear.Excellent analysis. Oh, thank you. Brain must’ve had a hiccup. Fixed now. Nice article. It does seem helpful to think about the current political scene in the U.S. in terms of what Jurgen Habermas described as a crisis of legitimacy. The traditional political class appears to have lost its grip and in its place we find Trump able to fuel his candidacy through his mastery of kayfabe political theater. It’s not easy to see where this is leading. A crisis of legitimacy seems unlike most other events and circumstances we are familiar with in our every day lives. Once the word gets out that the emperor has no clothes it becomes much more difficult for us to pretend the situation is otherwise. Importing WWF theatrics into our political arena may account for Trump’s popularity but it hardly seems to offer us a route to restore legitimacy in our political order. Rather, it’s seems much more likely that the crisis will only worsen if the kayfabe theatrics that Trump has unleashed on the political arena soon begin to spill over into government, finance and law. I think the issue is that while Trump takes advantage of and exacerbates the crisis of political legitimacy, there is not much evidence that the crisis will automatically spill over to a crisis of other social institutions (although the police are now increasingly under pressure because of various urban black uprisings that have punctuated the last year or two). The problem for the established political class is that currently it has no other way out of its predicament, but whether or not Trump wins that class will need to reformulate its relationship to the rest of society if it is not to continue having these problems. An outsider like Trump offers one (temporary, unstable) way to do this. Maybe over time other politicians will find new ways to rejig things — although at least on the GOP side they seem terribly stuck. I hafta say my noodle strains when I try to comprehend what legitimacy entails in this context. Perceived legitimacy? It reminds me of discussions in philosophy, where I not only don’t understand the nomenclature, but the concepts are out of my reach. As the article nicely and you clarify, politics has been exposed in a way that is unique enough to result in thriving candidate Don. My question is, is he the one employing kayfabe, or is he the one having chosen not to? I think the latter. As even media surveys repeatedly reveal, representatives act consistently against the wishes of the working class and instead at the behest of a client base. I hardly find legitimacy in that, democratically speaking. To amend: It’s not that I think he isn’t kayfabing some brand of populism, he just seems able to have done it in a way that capitalizes on the illegitimacy of his forebears. In intelligence speak it’s akin to a “limited hangout”. In general, this is a well written and intelligent piece – kudos. I do, however, suggest that you are completely wrong about immigration. Unchecked immigration – legal or illegal – drives wages down for the many and drives profits up for the few. Yes, there are any number of economic whores who claim that the law of supply and demand does not apply to the labor market, and any number of fake-liberals who have been paid to say that moderating the rate at which foreign nationals are allowed to come here so that wages aren’t driven down or crowding increased, is racism, but the reality is the opposite. Trump’s position on illegal immigration is the same as that of FDR and Samuel Gompers – it is the classic progressive position, before ‘liberals’ decided to sell out and support anti-worker trade and immigration policies and flack only about gay marriage. It’s kind of tiring to keep hearing that wanting the United States to protect it’s borders is racist, and I think Americans are getting tired of this. Call me a racist, I just don’t care. And that too, is part of Trump’s appeal. Suppose that I demanded that you take the locks off the doors of your house, and that anybody who wanted to could just walk in and help themselves to all that you had. Soon your house would be full of a lot of low-life, and even the decent people would be making you poorer through sheer numbers. And no, a bunch of poor people swarming into your house does NOT automatically turn it into a 30-story luxury apartment building. You complain, and I just attack you as an ugly racist and threaten to have you blacklisted from your job. At some point you wouldn’t take that any more, would you? I’ve caught a lot of flack on the Left for arguing that Trump’s border policy is not racist. I do think it is nationalist, but that doesn’t separate it from deporter-in-chief Obama’s approach. The argument is simply over how lax or tight the control of national borders should be, and the Left’s cries of “racism” are more to do with their panic at Trump’s message cutting through … Easier to blame the dark racist impulses of the voters than to think through what Trump is really about. I disagree with your more general position on borders (I’m not a nationalist, and I think the evidence about jobs and wages leans towards my support for ending all immigration controls). But that’s not really the issue here. Trump is saying to voters — almost all of whom support national borders and the American nation — that he will pragmatically fix the problem, even if it means being super-harsh. When you compare that to the mixed messages sent by the rest of the political class (“yes we want strong borders, but…”) it is simply Trump being a consistent defender of immigration controls. Nope. The only effective way to control illegal immigration is harsh employer sanctions. And that ain’t gonna happen. Instead, “we’ll build a wall.” LOL. Have to seen EJ Dionne’s “Why The Right Went Wrong” ? His theory is creatures like Trump/Cruz are the result of decades of failure of conservatives to deliver their promises. Not sure what the concern is re Trump from the left as he’s utterly unelectable at a general. Really interesting food for thought as to why Trump is and remains popular among people who are not ideologically left wing and don’t dismiss him instantly because of his outlanding statements about Muslims and immigration. We of the left can definitely be guilty of being dismissive of those tagged as “racist” or “facist” without nuance. During this interminable election campaign, I’ve had no doubt as a lefty that Trump is vastly preferable to Cruz and anecdotally have encountered an increasing number of people who say they want to vote for either Sanders or Trump – demonstrating the desire to go for the anti-establishment candidate rather than based on right wing or left wing ideology.